This section, “What’s Hot”, is where I will archive the posts that originally appear on the Home page under What’s Hot Now. My son, Freeman Wilson, attends the CIA (Culinary Institute of America) and right now he is in Spain on a cultural immersion trip. For culinary students, this means a lot of eating and drinking. Makes you want to go back to school, right? Since it is 2013 he is documenting every bite on Facebook and his followers have been able to peak into his gustatory experiences. Being a chocolate person, this one grabbed my interest. 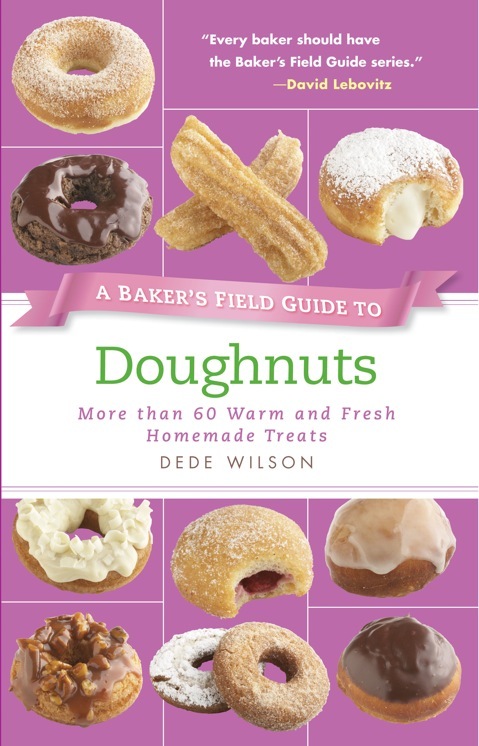 I also developed a Churros recipe in my Baker’s Field Guide to Doughnuts book. For those that don’t know, the churros, which are a fried doughnut-like pastry, are eaten alongside the thick hot chocolate that has a warm almost pudding-like consistency. 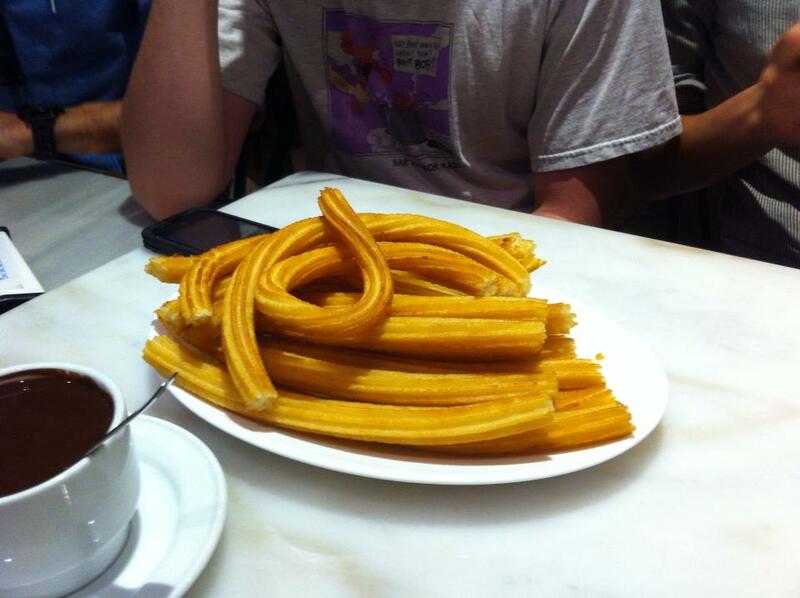 Dip a churro in the chocolate and man will you be in heaven. 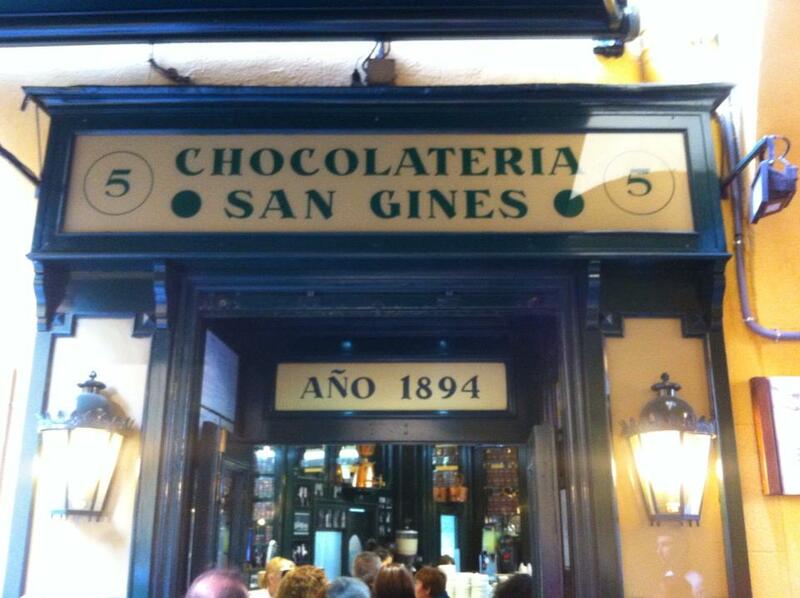 Freeman took the pictures below at the Chocolateria San Gines. You don’t need a deep-fat fryer to make these at home! Just a deep pot and a pastry bag and large star tip to pipe out the shapes. Look at that color! Frankly I can’t stop staring. I have been going a bit bonkers for rhubarb lately. It’s plentiful here in New England right now and I am lucky enough to be able to pick it straight from the garden. Well, a very nice friend’s garden, to be clear LOL. Her plants are so vigorous she has more than she knows what to do with. I have been making pies and crisps and wanted to branch out. Fancy cocktails are all the rage right now, and not being much of an alcohol drinker, I thought, hey, if I had a flavorful, colorful syrup around I could whip of a mocktail in a flash. The rhubarb flavor is subtle and you can adjust the ginger to be a background flavor or to be more prominent. The more colorful your rhubarb, the more colorful your syrup, so look for vivid stalks. 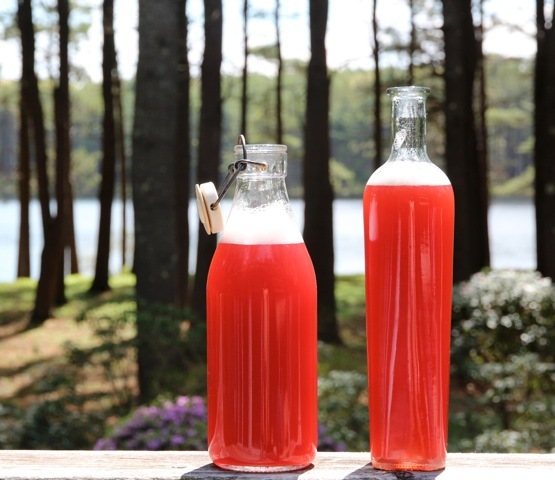 Combine Rhubarb Ginger Syrup with plain or flavored seltzers for a non-alcoholic beverage or use as an ingredient in vodka and gin drinks. I have strong feelings about bananas. I eat one every day and it HAS to have black speckles and absolutely no green tinge whatsoever. Typical shopping experiences usually unfold as follows: I walk into my main grocery store, usually Stop & Shop, and the banana bunches are green as can be. I immediately assess how many days I will be banana-less, waiting for them to ripen and its usually at least 4 days – and I get depressed at the prospect. So I buy the bunch, as an insurance for the next week, and then make another trip to my local tiny Asian market where they often have very ripe bananas. I buy a bunch of those and eat those until they are gone and if my timing is right, then the Stop & Shop bunch will have ripened and I will flow from one week into the next getting my banana fill. Only it never works out so perfectly. Somewhere in there nature’s ripening meter is not on my schedule and I end up with no bananas to eat and since the Asian store is sometimes out of ripe bananas, I’m screwed. Sigh. I know, not a big problem when it comes to life, but a produce issue nonetheless (my girlfriends call this a first world problem. Kind of like when you get depressed because the Chanel counter is out of the limited edition lipgloss). Anyway, it’s usually about banana bunches that are way too green or so overripe they have to get into the freezer, stat. Behold the image above. Same bunch. Bananas at wildly different ripening points. I have never seen anything like this in my life and when I saw the bunch, I had to buy it. Just for oddity sake. My boyfriend Damon said the ripe one looked abused. If any of you have a clue as to how this was possible, I would love to know your thoughts. When I ate the ripe one, it was not bruised (abused), it was truly ripe! And then the others ripened as you would expect….any ideas? I developed this recipe for Driscoll’s and it features all kinds of berries, a white cake, simple buttercream and lots of coconut! Easier to make than it looks, too. Check out the recipe for my Berrylicious Bunny Cake. 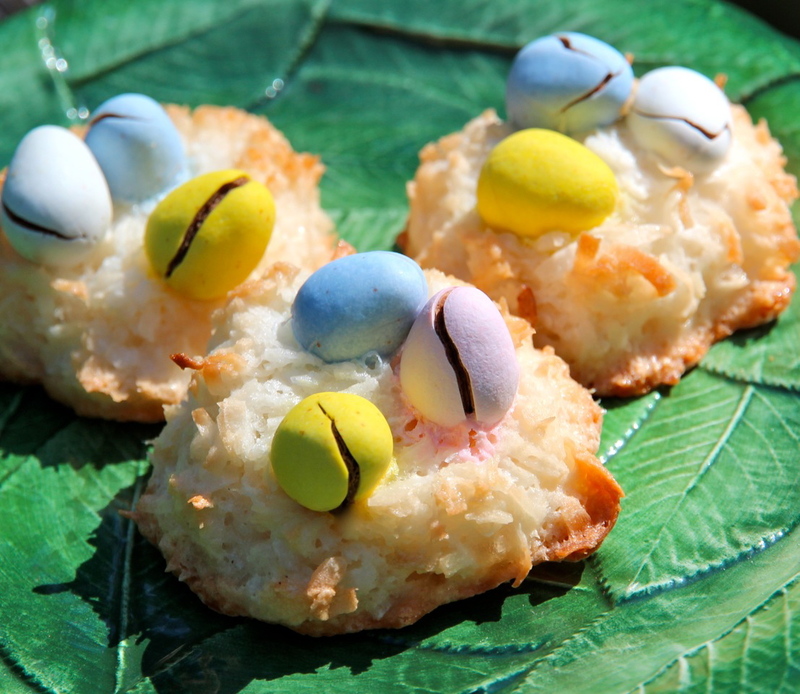 It will be a hit at your Easter party and is even easy enough to make with kids. Ahhh, this picture makes me happy. Looks refreshing, doesn’t it? An early March day in New England yet the temperature was warm with the bright sun reflecting off of the snow. Love the way the sun highlights the colors of this hard cider. I had been sent some samples of this new beverage enlivened with the essence of elderflower. 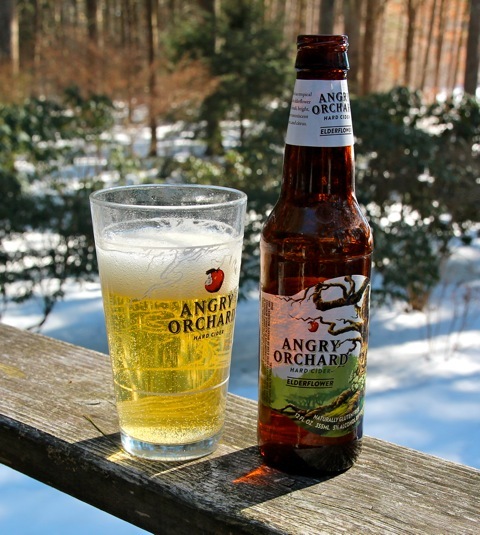 Angry Orchard specializes in hard ciders and has a line up that includes Crisp Apple, Traditional Dry, Apple Ginger as well as Elderflower, their newest blend. They all feature an easy-to-drink 5% alcohol making them a very light, refreshing beverage. I was worried it might be too floral. In fact, I held on to the bottles for a while, eyeing them on my desk warily. I was going to have to be in the mood. I needn’t have worried. I popped open a bottle and poured it into the glass. The head isn’t very long lasting, but I was already getting wafts of the fruity, but delicate, aromas. One sip and I was thinking “why did I wait so long!” Angry Orchard describes it as an amber color ( I think it is more delicate) with tropical notes from the elderflower and hints of lychee, pear and citrus. I get a crisp, slightly dry note from their apple blend balanced with a light floral note. The balance is there…you know you are drinking an apple based beverage but the elderflower adds some exoticism and intrigue. And as an aside, this is a gluten-free product. Nice. For many gluten sensitive folks, the world of beers and similar beverages can be fraught with intolerant ingredients. This is a great addition to your adult beverage selections, whether this is an issue for you or not. As someone who always appreciates something different, I was thrilled to be introduced to this drink. Cheers. Many months ago I was sent a bag of Zulka Pure Cane Sugar to test and review. I am always interested in new baking ingredients and while sugar is not new, there are more and more sugar products apparing on the market. Many of them are going in the direction of being less processed and I have come to appreciate the subtle pure cane flavors that they bring to baked goods. So I started thinking about how I wanted to showcase the sugar and new I didn’t want to do anything with a chocolate base, as that would hide the actual “taste” of the sugar. I think many people don’t think about the “taste” of sugar, but that’s because they are used to white granulated sugar, which really has very little flavor other than a generic sweeteness. The idea behind this product is that this granulated, light beige sugar tastes just like what you experience when you bite into fresh sugar cane – only its much more convenient! The beauty of these more raw sugars is that they Do bring a flavor profile to the product. Think about how pronounced a light or dark brown sugar can be. This is somewhere in between…it can be substituted for white sugar in any recipe, bringing a delicate but distinct flavor to your baked good. I started with a blondie recipe, looked in my pantry and came up with these: Milk Chocolate Almond Blondies with Candied Orange Peel. Delicate, elegant, easy and fast. 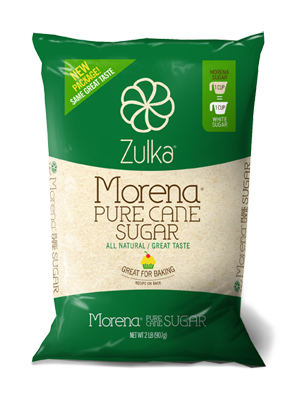 Look for Zulka Pure Cane Sugar at Wal-Mart, Safeway, Sam’s Club and other large retailers. Red velvet is here to stay! Here is my take on this fave in cake ball form. Super easy to make, the cake is baked in a 13 x9-inch pan, crumbled and combined with cream cheese frosting. I like these dipped in milk chocolate, but you could use white, dark or red or pink coatings, if you like. Rich, pretty and easy. 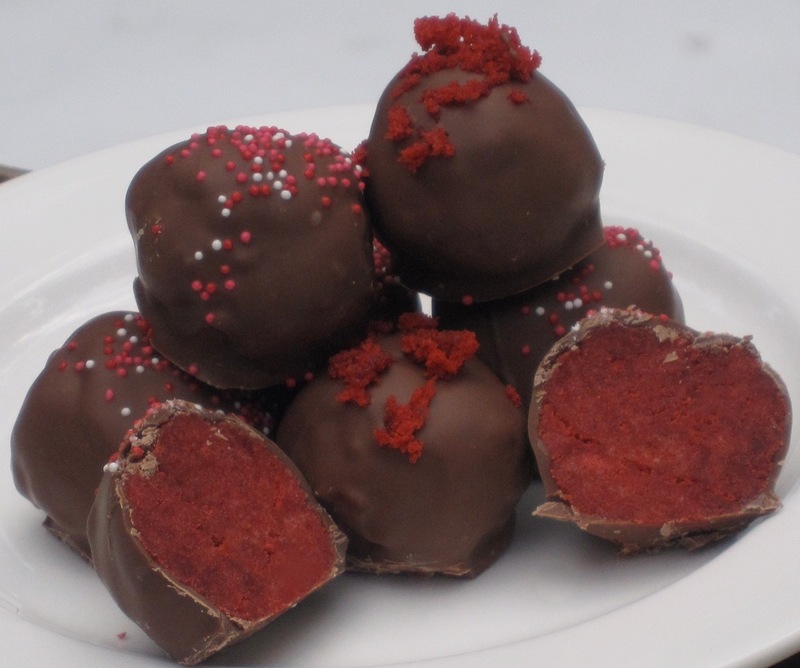 Red Velvet Cake Balls are a great choice for a V-Day office or school party. 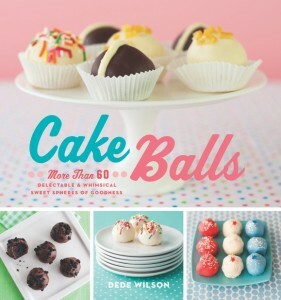 To see more cake ball recipes check out my newest book, Cake Balls (Harvard Common Press). Heart-Shaped Chocolate V-Day Dessert? Yeah Who Woulda Thunk It? Ok, Ok I know this is a literal interpretation of a V-Day dessert, but come on! You have to admit, they are really pretty:) I call these Raspberry Hearts and they start life as a cake ball-esque mixture, but instead of rolling into balls, the mixture is compressed in a pan then cut into heart shapes. 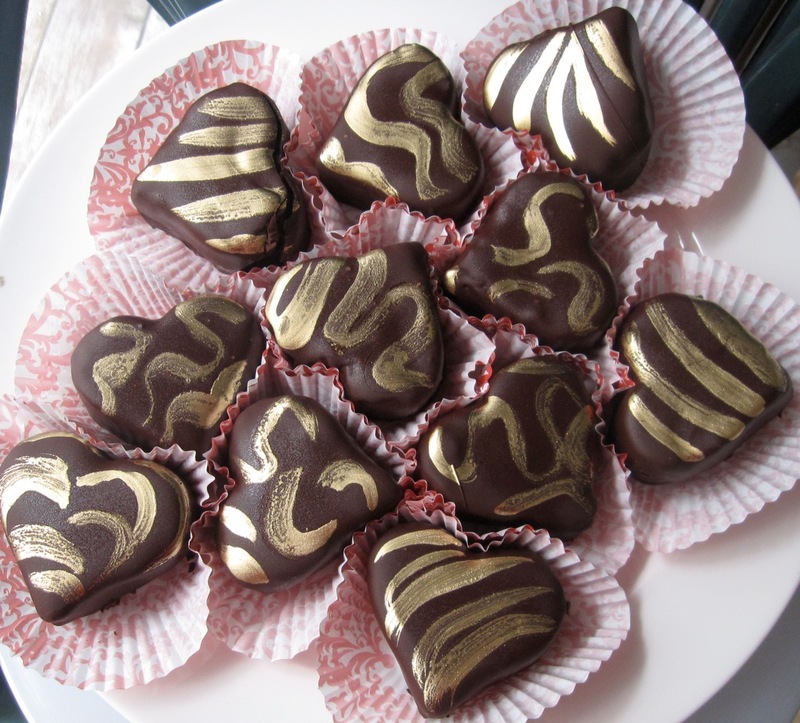 The edible gold powder elevates these into a truly special treat. A truffle and a cake ball rolled (literally) into one. 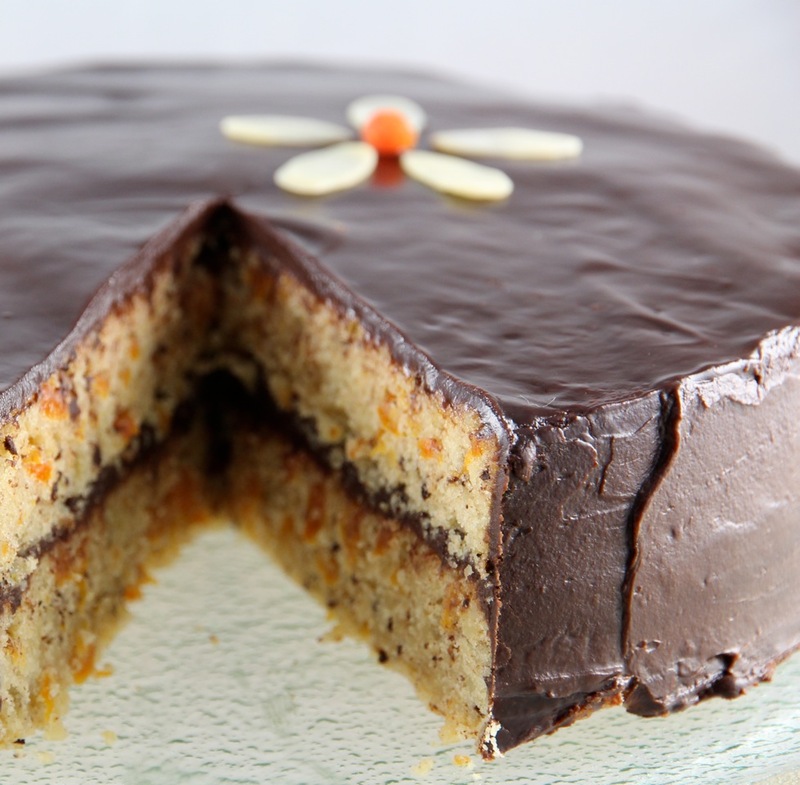 Moist chocolate cake is combined with a dark chocolate ganache, which is what is found in a truffle center. 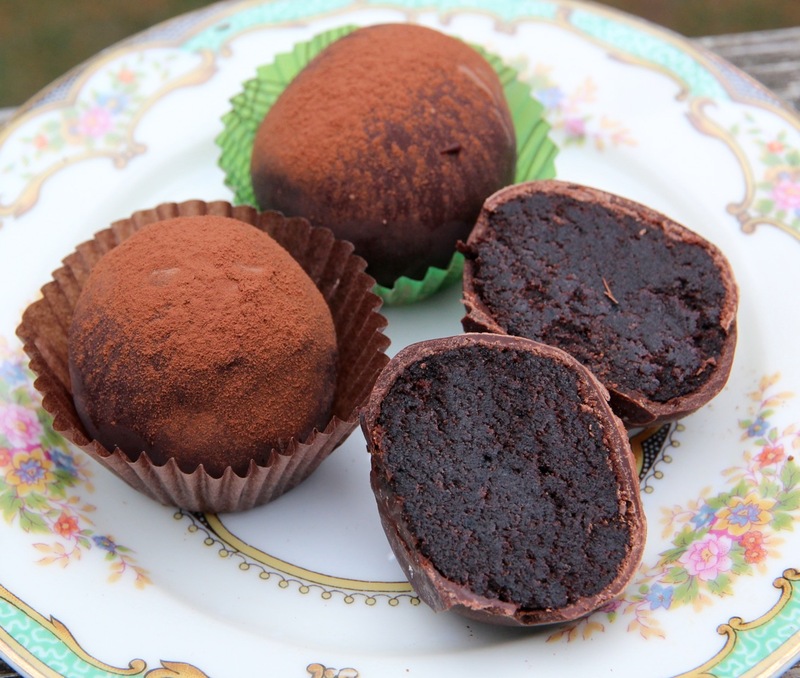 The cake balls are dipped in a chocolate shell and embellished with a dusting of cocoa – just like a truffle. 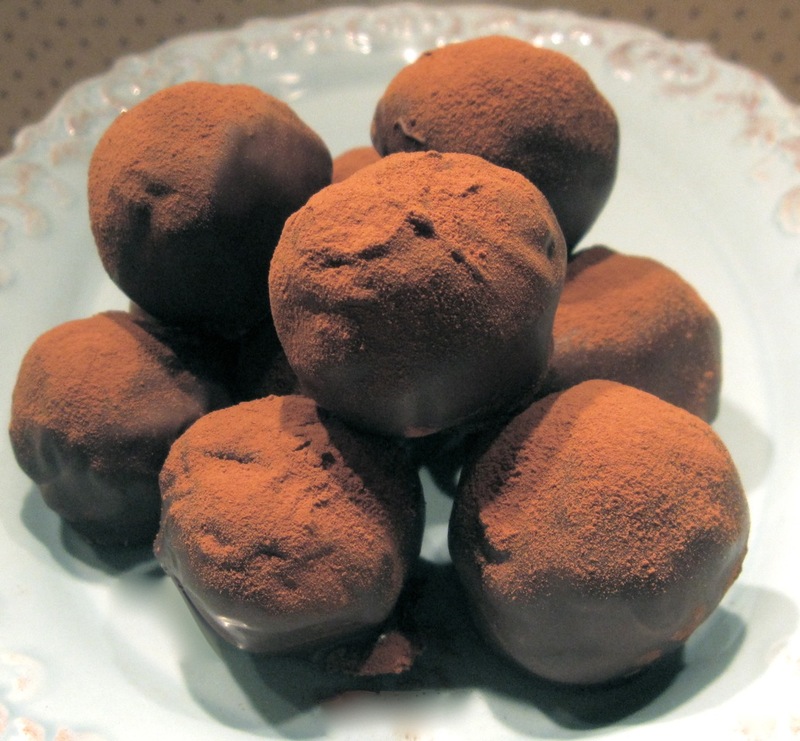 Of all my V-Day inspired recipes, Cocoa-Dusted Truffle Cake Balls are the ones I am making for my loved ones. More recipes like this one can be found in Cake Balls (Harvard Common Press) my newest book dedicated to these tiny, round creations. An ardent fan, Sofia, sent me this fabulous pic above! 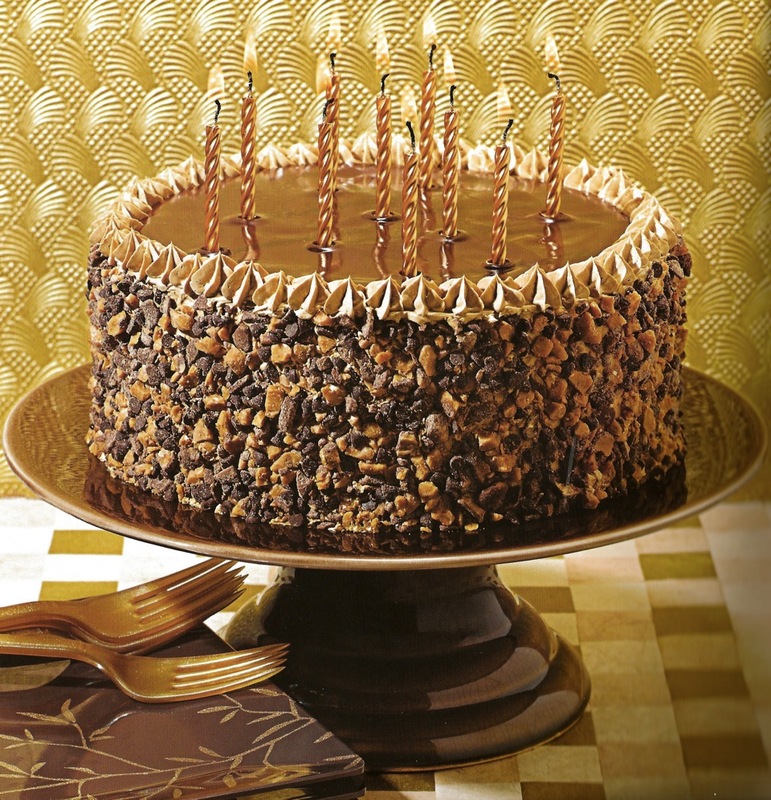 I love the Mocha Toffee Crunch Cake from The Birthday Cake Book and she made a wonderful rendition. I love, love, love seeing your work. Send them along…and please give me permission to post. I would to share the inspiration. This Sunday is about the game, food, the commercials and the food. Lots and lots of food, savory and sweet and recipes that make large batches are a huge plus. These brownies are easy, ridiculously deep, dark and rich and you can cut up to 80 brownies out of the large pan. I call them Extreme Chocolate Brownies and they are my absolute favorite. Bake them up Friday, Saturday or Sunday morning and you will be ready to serve the crowd. You do need 3 kinds of chocolate, but hey, that’s what makes them so delicious. Ahhhh the combination of dark chocolate and a hit of salt is a thing of beauty. If you have ever baked anything from bread to cake to cookies, and forgotten the salt, you know how bland the result can be. But have you ever ramped up the salt to make it more of a feature? Salt is a big thing in the dessert world these days and these cookies highlight the trend perfectly. This recipe was originally published in A Baker’s Field Guide to Chocolate Chip Cookies where they are called Couture Chocolate Fleur de Sel Cookies. Enjoy! Well, Thanksgiving got in the way so it took me some time to hit the kitchen and develop the recipe for our contest winner! I had run a contest for fans to come up with a flavor profile for a cake ball, which I would then develop and name after them. Fans voted and Cameron Bailey’s concept was the winner! This was exciting; I liked the flavor combos and could taste them in my mind and couldn’t wait to try for real. Here is how the recipe testing unfolded. I first set out to caramelize some pineapple and while it is possible to do this at home, it can be a lengthy and persnickety project. I keep hearing from fans that they like Easy, so I decided to use the dried pineapple that can often be purchased in bulk at places like Whole Foods. 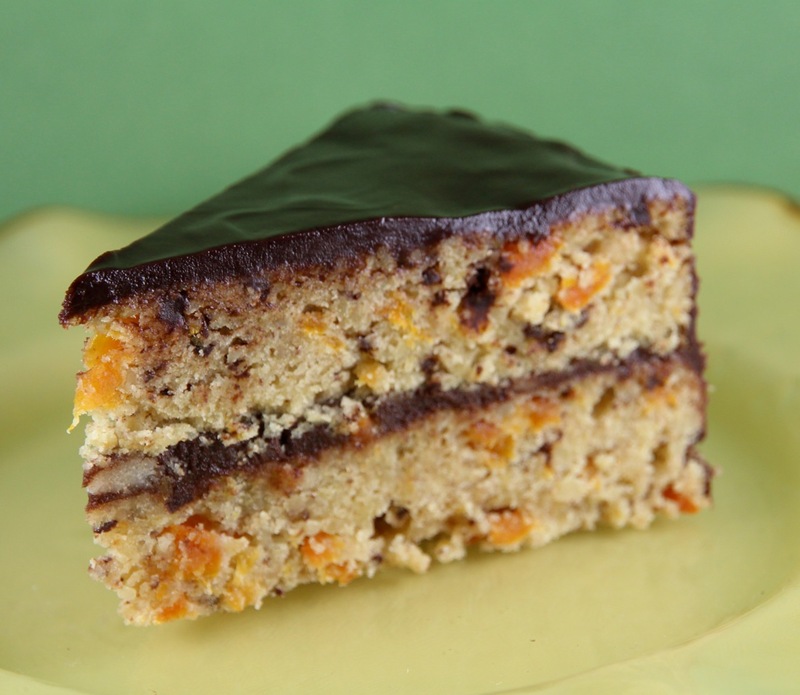 It has sugared added, so it is sweet and chewy, adding a textural dimension. It’s sort of dried, sort of candied. Then the first thing I did was make a yellow cake with bits of the chopped, dried pineapple in it. Not pineapple-y enough. Then a friend gave me a recipe that uses an entire 20-ounce can of crushed pineapple in the batter – along with the juice. This sounded like a great way to go. I made the cake and there was much improvement on the fruit flavor front. So I crumbled that up, added some chopped dried pineapple, and folded in purchased dulce de leche as binder until the mixture held into balls. Believe me, at this point in the testing I was tasting A Lot:) Soooo good. Then I chilled the balls and while they were tucked away in the frig I chopped up some more dried pineapple for the tops of the dipped balls. I used Valrhona Ivoire white chocolate for the coating. This white chocolate melts down very smoothly for a white chocolate, which can sometimes be thick and gloppy. With any white chocolate, make sure not to overheat while melting. 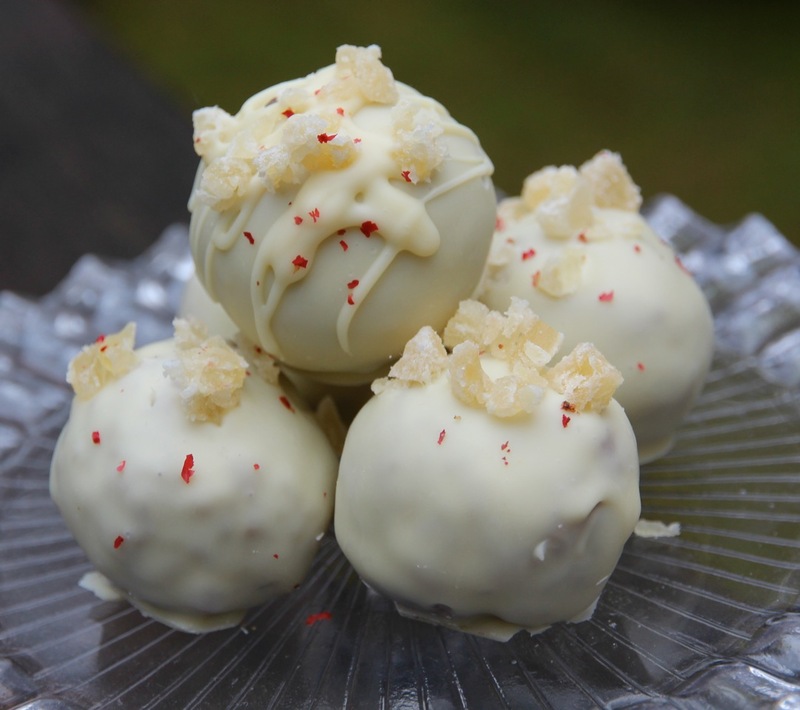 I dipped the balls in the white chocolate and immediately sprinkled the tops with the reserved dried pineapple and a few grinds of pink peppercorns. Not only does the pepper provide a spicy bite, but it looks really pretty as well. Cameron, I hope you are happy with the result, which I have named Cameron Bailey’s Pineapple Dulce de Leche Cake Balls. Thank you for your creativity and have a great holiday everyone! 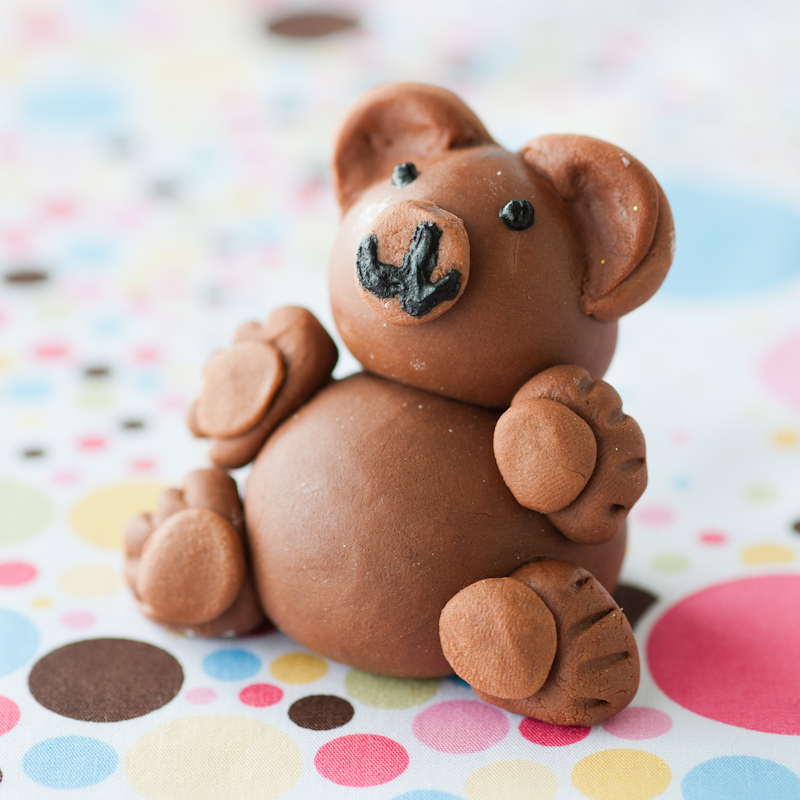 Image of Teddy Bears cake balls from my book. The head and the body are both cake balls inside! Cake balls are fun. They look cute, they are practically bite-sized, which always seems whimsical for some reason, and kids love ‘em. I think anytime we can enjoy a personal pastry just for ourselves, it feels extra special. And that goes for adults, too. School vacations are the perfect time to get busy in the kitchen with kids. It’s creative, there is math involved (seamlessly woven throughout) and you end up with something yummy to eat. There are several components and steps during the cake ball making process, but rather than feeling daunted, think of them as individual steps that can be done over several days, and many of them are ones that kids can help with. 1. Kids can certainly help with the measuring of ingredients – it’s a great way to learn how to bake from scratch. 2. Rolling the balls can take some time, but it isn’t hard – and it is much more fun if you have a helper in the kitchen with this step. 3. Teenagers can help with dipping and it’s all-hands-on-deck when it comes to choosing decorations and sprinkling or piping them on top. 4. Placing the balls in fluted paper cups is a perfect pastime for small fingers. In fact, pretty packaging for the holidays is a must and you can veer way into crafting territory is you like. 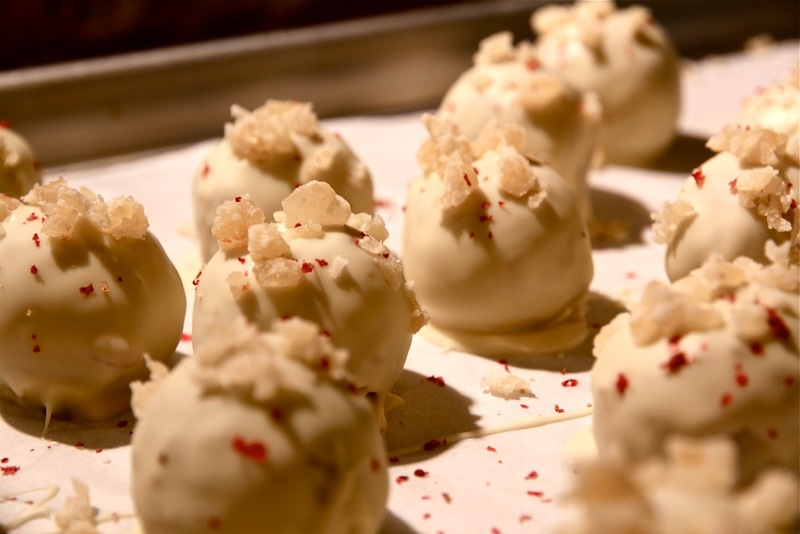 Make this a family affair – or grab the neighborhood kids and make cake balls as holiday presents. It’s not too late to order my book, Cake Balls, for the holidays. If you would like a personalized bookplate, just let me know! When thinking of food around Thanksgiving two items immediately come to mind: turkey and cranberries. 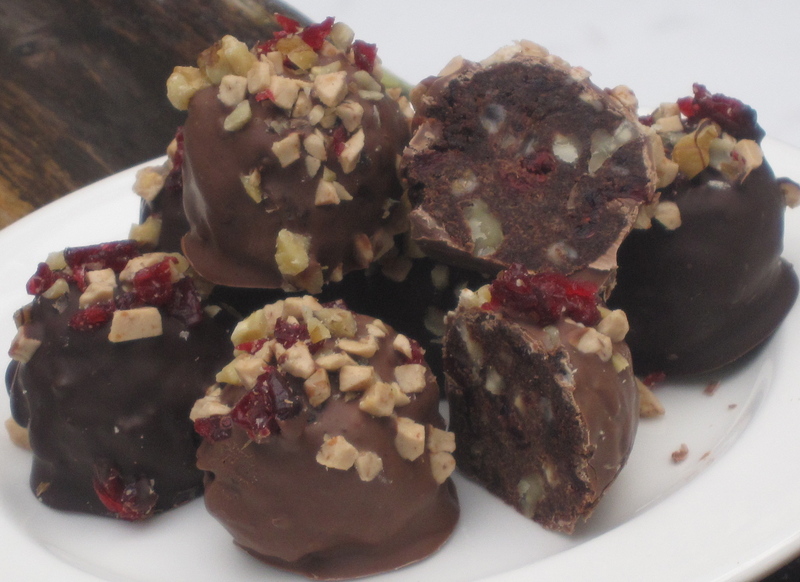 While creating a turkey cake ball would be rather interesting, the Cranberry Toffee Walnut cake ball will be the perfect Thanksgiving treat to make over the holiday weekend! While others are shopping, why not get some stress release in the kitchen by using your hands to create something delicious. This perfect combination of the sweet chocolate mixed with the nutty walnuts is perfectly completed by the tangy cranberries. This simple recipe will be fun for the whole family this season from my new book Cake Balls. So move aside turkey, there is a new late-fall favorite! 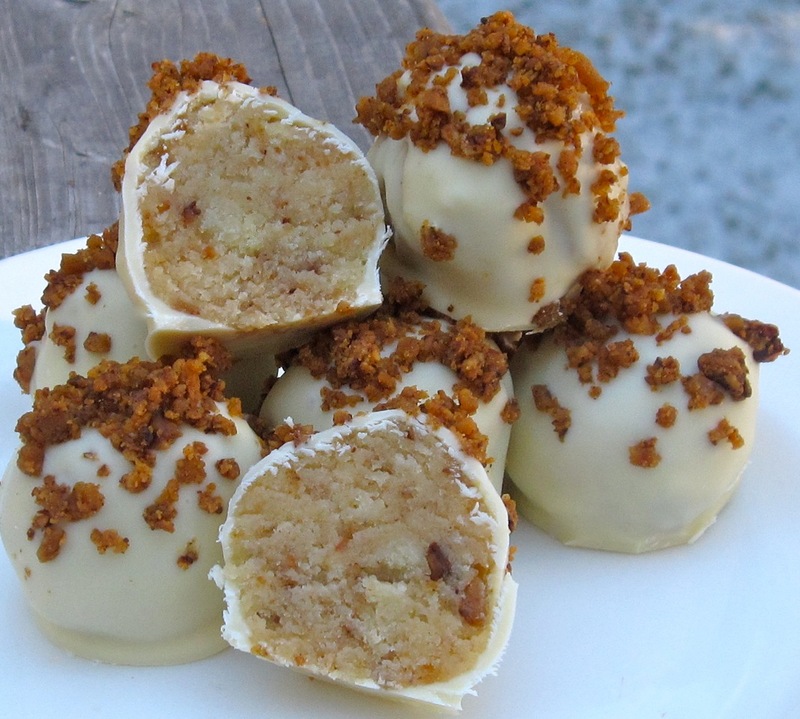 EVERYTHING is Better with Bacon – Including Cake Balls! See the bits of bacon nestled within the chocolate cake that is soaked with bourbon? The whole enrobed in milk chocolate? YES! I’m telling you, these are AWESOME! The combo might sound weird to some of you, but trust me, if you like chocolate and you like bacon, you HAVE to try these. You could leave the bourbon out, for a non-alcoholic version, so don’t let that deter you – but it adds a great smoky, adult dimension! 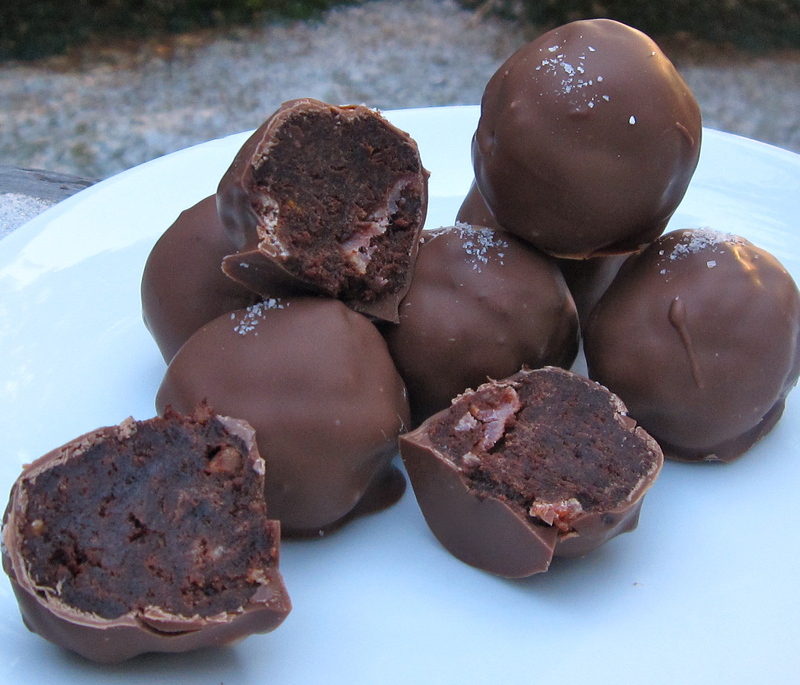 You will notice in the recipe for Milk Chocolate Bacon Bourbon Cake Balls that there is an optional bacon salt sprinkled on top. And it is a vegan product. And kosher. I’m not kidding! You’ll have to go to the recipe to read more about it! Working on the breadth of recipes for Cake Balls was a joy…making sure that many classic cake recipes were represented (German Chocolate Cake Balls, Key Lime Cake Balls, etc. 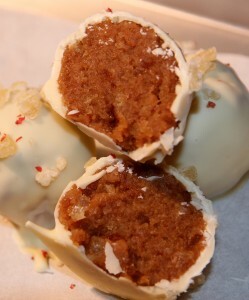 ), coming up with new flavor combos (Cassata Cake Balls, Gingerbread Cake Balls, etc. ), making sure that many were kid-friendly (Chocolate Chip Cookie Dough Cake Balls, Confetti, etc.) as well as some that were decidedly adult (Mudslide Cake Balls, Creme Brulée Cake Balls, etc.). And then it dawned on me that I couldn’t ignore my vegan friends and had to figure out a cake ball to satisfy their needs. I am thrilled with the results as my Vegan Cake Ball is just as luscious as any other in the book, truly taking no shortcuts. It is a fabulous recipe that stands on its own, combining chocolate cake, your choice of jam as a binder and a dip in dark chocolate. An optional dusting of cocoa on top as shown in the picture is a nice embellishment. I am partial to using either apricot jam or orange marmalade, but that choice is up to you. People ask me all the time how I come up with recipes. What makes a recipe “new” and worthy of publishing? Well, think about it…how many recipes can you find for chocolate chip cookies? THOUSANDS. 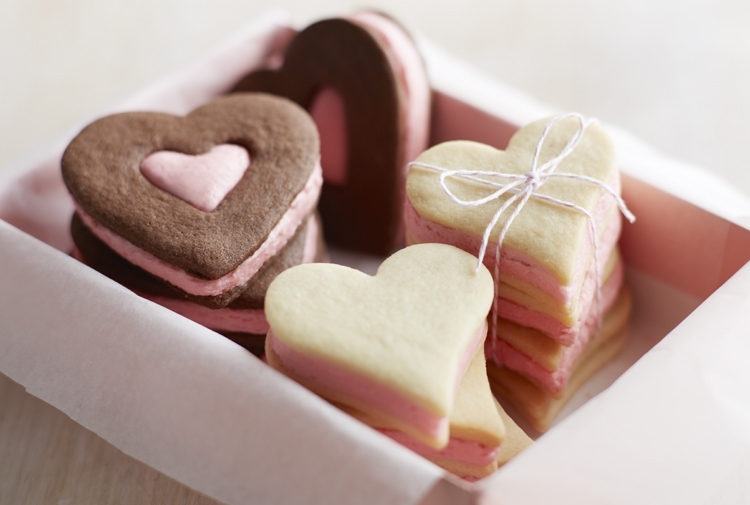 But each one brings a nuance that makes it different from the rest – the proportion of brown sugar to white; the chilling time; the technique of forming the cookies; the size of the cookies; the type of chocolate used. The list goes on. Every now and then, a “new” recipe or recipe concept pops up and cake balls, while they have been around now for a while, kind of fit that bill. They aren’t a cupcake or a brownie or a truffle but sort of a combo of all the above. Regardless of the kind of recipe I am working on, I always begin with flavor in mind. So let’s say I want to make a lemon cake ball. I am going to think about how I can maximize the lemon flavor, which usually means that lemon appears in the recipe more than once. In my Zesty Lemon Cake Balls in my new book Cake Balls, I start with a yellow cake, which color-wise, evokes lemon. Extra lemon zest is added to that batter, which is then combined with Lemon Curd, which of course is one of the most lemony components out there! A dip in white chocolate made sense since it has a delicate flavor and then I crowned the top with candied lemon peel. That’s a lot of lemon packed into one tiny confection! Of course that’s a cake ball with a single flavor profile…what if I want to combine chocolate and banana? Or carrot and cinnamon? I really take a very democratic approach to recipe development – there are so many palates out there! There is very little right and wrong. What do YOU like? Get in the kitchen and play, play, play. My Cake Balls book is laid out so that you can mix and match and develop your own cake ball creations. Send me pics! In my opinion, butter pecan ice cream is highly underrated. 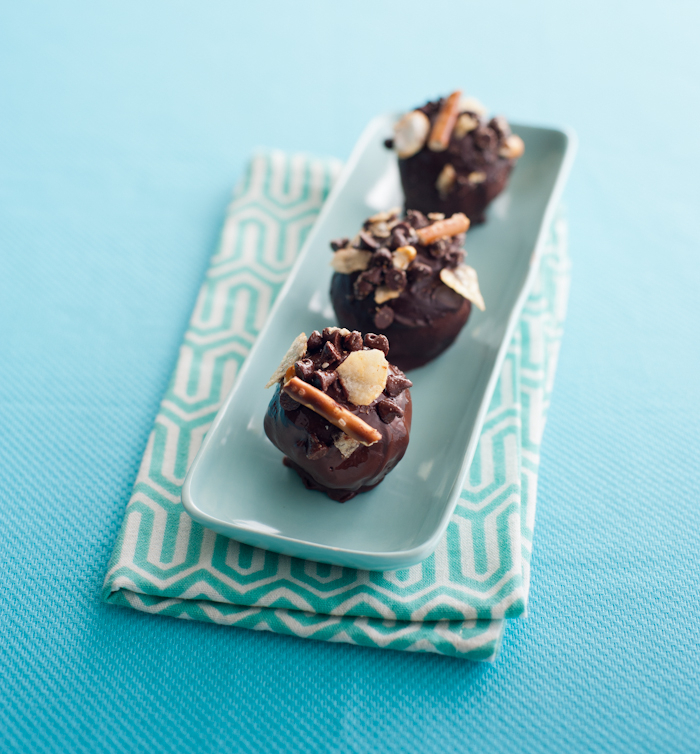 There is something about the creamy, dairy flavors accented by the crunchy, nutty pecans that I simply love and I wanted to create a cake ball homage. This recipe begins with a homemade pecan toffee combining butter, sugar and a hint of salt. The basic yellow buttermilk cake forms the base and a dip in white chocolate finishes them off. The nuttiness and deep, caramelized sugar flavors of the toffee cut the sweetness of the white chocolate. 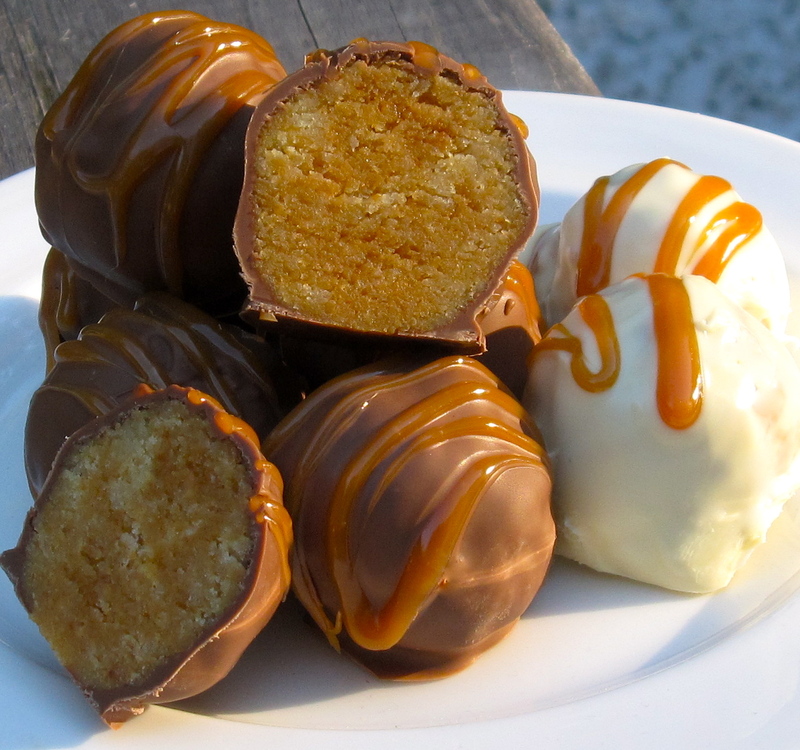 I present to you Toffee–Brown Butter–Pecan Cake Balls. The photo above was taken in my kitchen during my recipe testing for my Cake Balls book. It depicts my Dulce de Leche Cake Balls and of all the photos I shared with friends while testing, this is the one that got the most responses…while the caramel drizzle on top pops against the white chocolate, that combo is quite sweet. I prefer these cake balls when enrobed in milk chocolate, but as always, follow your palate. 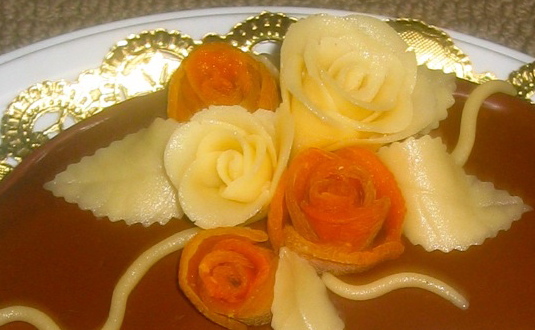 The recipe is made from crumbled yellow cake combined with dulce de leche. Once rolled, you can dip them into your choice of chocolate. The final embellishment of caramel drizzle is a nice touch. Ta Da! Both A Baker’s Field Guide to Doughnuts and Cake Balls: More Than 60 Delectable and Whimsical Sweet Spheres of Goodness debut this week. In all my years of authoring books, I have never had two drop at once! Huge Thank You to my publisher, Harvard Common Press, for always doing a great job with the production and the press. If you order the books and would like a personalized bookplate, just drop me a line. I’d be happy to send you one! People love anything and everything covered in chocolate but whether its chocolate covered pretzels, potato chips, or bacon, the extra saltiness makes the treat irresistible. My recent book, Cake Balls, introduces the perfect little indulgence for all you salty n’ sweet lovers: The Crunchie Munchie…a combination of Milk Chocolate Brownies, Milk Chocolate Ganache, pretzels, caramel corn, potato chips and dark chocolate. Sweet and salty in every bite. The pic above is from the book. 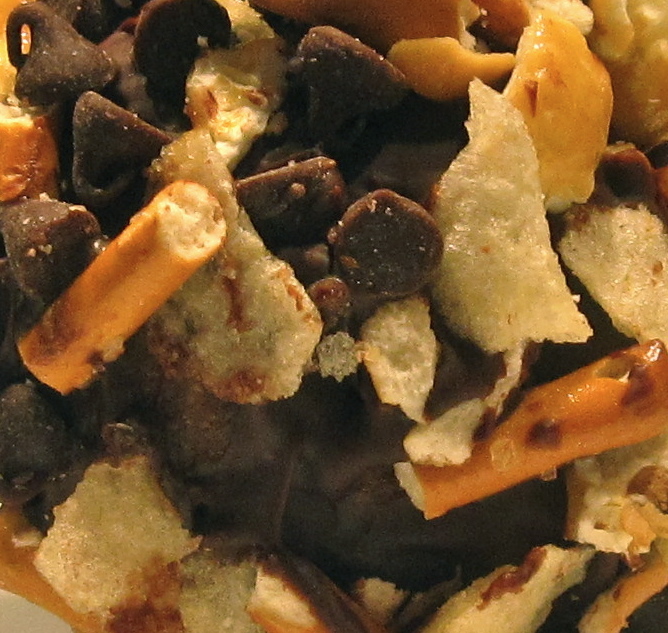 When I made them at home, I went a bit overboard with the toppings…look at this close-up below of my cake ball’s surface. YUM. LOL….sometimes more can be better. Which way will you make them? I was always intent on providing some exclusive cake ball content for my site, outside of my book, and here is the first installment. Yes, truth be told I had the Lemon Curd in the frig already, so I was ahead of the game, but what inspired me was not only that pastry kitchen staple, but the last gasp of fresh blueberries from the market. Lemon and blueberry make a great pair, and I realized that I had not brought them together in a cake ball. To enhance their fresh, bright flavors, I went with a dunk in white chocolate. I tinted a tiny bit of the white chocolate with Wilton Cornflower Blue Icing Color to zigzag on top. The enthusiastic designs you see were made by a young friend who helped me bake. Artistic expression and freakin’ awesome tasting desserts are the goal! These started with Yellow Buttermilk Cake combined with Lemon Curd and fresh berries, rolled into balls, then dipped in white chocolate. I like using Valrhona Ivoire for its thin viscosity. The whole recipe is here: Lemon Blueberry White Chocolate Cake Balls. Would love to see your pics! I might post them if you send them along! White cake, speckled with multi-colored sprinkles both inside and out, has become a favorite birthday cake. Sometimes referred to as “funfetti”, it is often prepared from a boxed cake mix and canned frosting, but it is very easy to make from scratch. Rainbow sprinkles are folded into white cake batter and once baked, leave little bursts of color. Then the same sprinkles festoon the top of the cake as well. 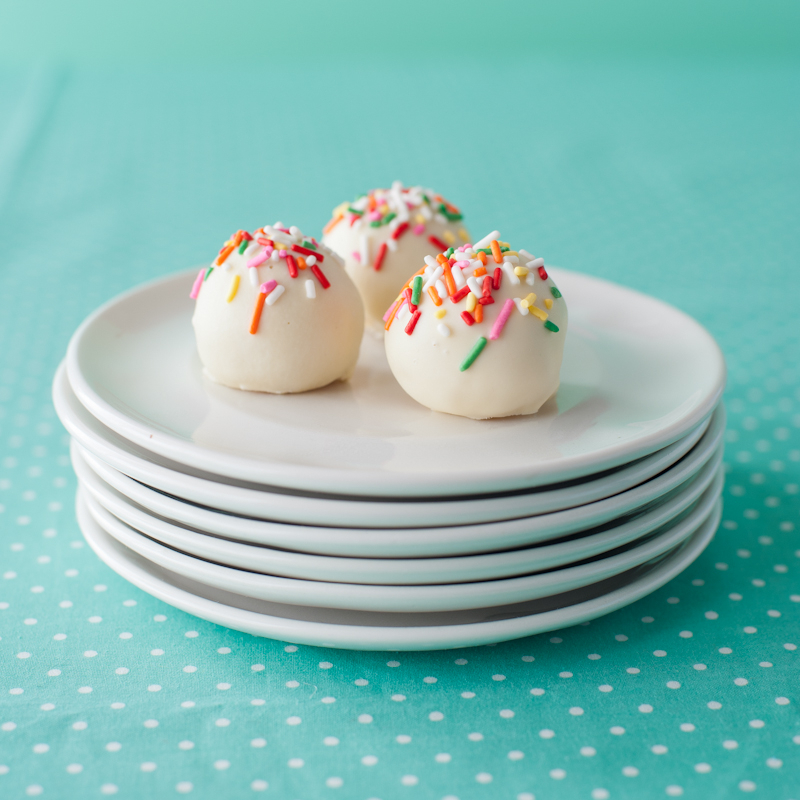 When I was picking and choosing recipes for my new cake ball book I knew I had to include a confetti version – they always make me smile and are also a great choice to make with with kids on a day home from school or to bring to a party! This will be the first of many cake ball recipes. No one can turn down this classic treat with moist white cake exploding with color dipped in irresistible white chocolate! I’m thrilled to introduce you to my newest book, Cake Balls (Harvard Common Press), which will be released in about a month. Check this space often for recipes, tips & techniques, general cake ball info and some contests I will be running. Right now I have a week-long contest on my Facebook page for you to win a copy. ENTER HERE. As always, I would love to see pics of cake balls you have made….inspiration comes from so many places! This always sounds like an antiquated phrase to me…”it’s a good keeper”…hailing from a time when cakes of all sorts made regular appearances in homes. The “good keepers” are the ones that stay fresh and moist for days and this one feature makes them attractive. After all, when you have taken the time to make something from scratch, isn’t it nice to enjoy it over a period of time? I suppose moistness is not always the deciding factor – biscotti, after all, keep quite well. 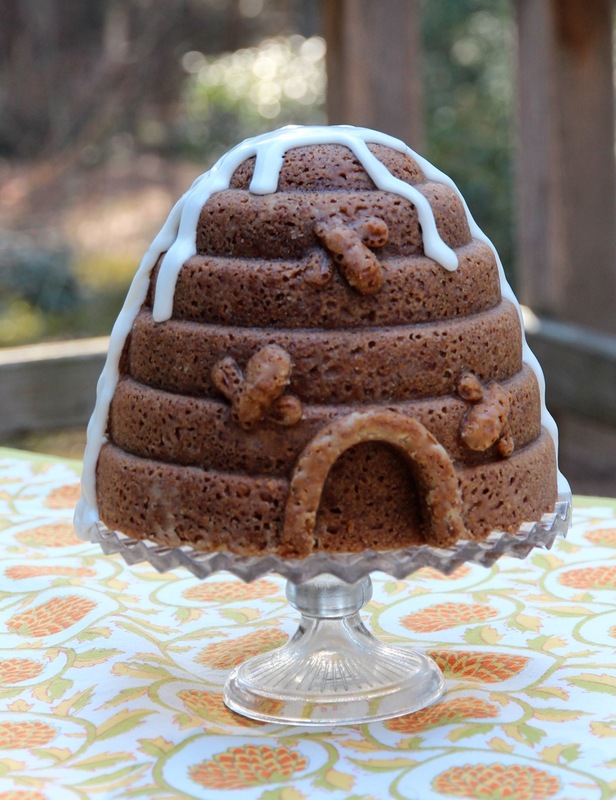 But look at this stunning cake below: moist, fragrant with honey and orange and an insanely good keeper. If there had been any left on Day 4, it would have been thoroughly enjoyed. The recipe came together from disparate sources of inspiration. My good friends Pam and Jeff Rys had the pan (being the good bee-keepers that they are) and I became obsessed with the idea of a marmalade cake. Not spreading marmalade on a cake or to be used as a filling, but incorporating into a batter. I reached out to some on-line food friends and Voila! Lévana Kirschenbaum came to the rescue. (You can substitute a 10-cup volume tube or Bundt style pan). I think you will thoroughly enjoy this Honey Orange Marmalade Cake. Having written two cookbooks on wedding cakes, people often assume I would rather be making something lengthy and challenging. There are times for that, but I always make sure I have a couple of easy celebration cakes up my sleeve. Birthdays, office parties and other events seem to pop up all the time – often with little notice. In fact, it is such a popular subject that I am teaching a two-day course at The Baking Education Center at King Arthur Flour in Norwich, VT. Come join me for these hands-on classes on Friday June 29th and Saturday June 30th. (They have recently sold out but please try putting yourself on the wait-list). This is one of my go-to cakes for such occasions: an easy chocolate cake, brushed with Kahlua (optional, but oh so tasty), espresso Italian Meringue Buttercream, topped with a rich poured dark chocolate ganache and the sides completely covered with a mixture of toffee bits and mini chocolate chips. It never ceases to draw praise and folks want the recipe…it’s so easy, they won’t believe it. I leave it to you whether you want to share it or not. Another added bonus is that this cake keeps pretty well. I often bake the cake on Day 1, storing the cake layers overnight wrapped well with plastic wrap. Assemble the cake on Day 2, refrigerate and serve on Day 3, bringing to room temperature before serving. The cake formula is very moist and the buttercream seals in all the moisture. 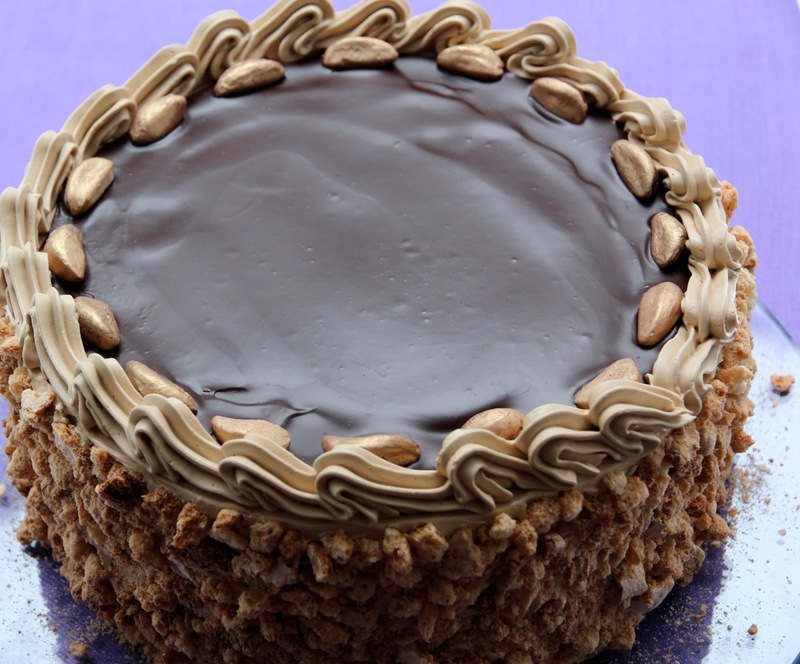 I am sure once you make my Mocha Toffee Crunch Cake you will return to it again and again. My Existence is Justified? Is Yours? Am I being a bit dramatic? Perhaps, but it was my cousin who told me that I had justified my existence with the invention of the cake pictured above. He said if I never created another dessert in my entire life, I would still have reached my zenith of creativity and deliciousness. People ask me all the time what my favorite dessert is and there could never be just one, but this just might be my fave in the cake category. My BFFs Juanita and Mary are both gaga over it and readily proclaim it is their absolute favorite – or as Juanita says “The Best Cake in The Whole Wide World”. She wants me to go into business just making this. Churning out cake after cake in a little shack. She even found me the little shack. It happens to be behind her gym. I asked her if she needed a drive up window LOL. I know where Her priorities lie. It all started with a conversation about which candy coated chocolate mini eggs are the best. This was happening during a gym workout with my small class of ladies – you would like my gym. We work out hard and talk about food A Lot. Mary was extolling the virtues of Cadbury Easter Candy Coated Mini Eggs and others were in agreement. Apparently I was missing something. I went out to buy a bag, which wasn’t easy. Stop & Shop supermarket was sold out; I guess I was late to the party, but I did snag some at CVS the drugstore. To validate such a purchase I told myself I would build a recipe around them and therefore not only be able to justify the purchase, but I could write off the bag of candy and make the world a sweeter place. Things didn’t work out as planned. I immediately thought about coconut “nests” to hold the eggs. I was most of the way there as my Coconut Snowballs from A Baker’s Field Guide to Christmas Cookies are truly fabulous. They combine unsweetened and sweetened coconut, which I find is needed for the perfect flavor and texture profile. The sweetened long shred coconut provides sweetness and a great chewy texture, while the addition of part unsweetened tempers the over-the-top sweetness that some coconut macaroons suffer from. I whipped up a batch, pressed three eggs in the top of each “nest” and popped them in the oven. As you can see in the picture, the eggs cracked – not what I was hoping for or expected. I brought them to the gym ladies, apologizing for the “failure”. I was surprised by the collective reaction….everyone thought they were adorable and that the cracks were on purpose! They thought the cracks were evocative of Spring – new life, re-birth and all that. Hmmm, I’m not completely sold but figured, hey, maybe they are worth a post and a recipe. They are certainly tasty. BTW, pressing the eggs into the nests does not work after baking (I tried). So if you can embrace the site of broken shells, these just might bring something a little different to your Easter holiday. Enjoy! Follow the recipe for Coconut Snowballs, add 2 bags of the eggs to your shopping list (you need about 50 eggs total) and simply press 3 eggs into the nests before following baking instructions. And more importantly, bacon IN the cookies. As promised (I know I have been teasing you via Twitter and Facebook), here are the Bacon Oatmeal Raisin Cookies I have been raving about. They are featured in the March 2012 issue of Bon Appetit and the recipe comes from Autumn Martin from Hot Cakes Confections. Make sure to check out the VIDEO so that you can see how they are made. I will be bringing you videos of Bon Appetit recipes that catch my eye and this one certainly did. First of all, trite as it may be, I do believe that most things are enhanced by bacon. Certainly my life is. While I have been enjoying the trend of chocolate and bacon, the lack of chocolate is exactly what caught my eye with Autumn’s recipe. When I spoke with her she said that while chocolate and bacon were okay, she actually prefers her bacon with buttery flavors. This cookie was born from her fond memories of having breakfast for dinner as a child – specifically her Dad’s waffles embedded with bacon and slathered with butter and maple syrup. (Maybe they will adopt me). The recipe has a few particular nuances that make it as fabulous as it is. A high proportion of dark brown sugar to granulated, to enhance “the depth of flavor and moisture”, says Autumn, as well as sweet, plump raisins that act as a counterpoint to the salty pork product. In Bon Appetit we suggest cutting the bacon into small pieces before sautéing, and this approach works fine – I did it in two batches. If you prefer to cook your bacon first and crumble later, you can place all the bacon on a sheet pan and bake in the oven. The batter is scooped as soon as it is made, then the cookies are chilled on their baking pans. I asked her why not scoop after chilling and she said this is her preferred approach as it is easier to scoop while still very soft. While this is true, if you do not have room in the refrigerator for a whole baking sheet, simply chill first, then scoop. Once on the pans, the cookies are very firm and domed. You do not need to flatten them before baking. The oven is at a hot 375˚ F and you must watch them carefully. Some cookies get away with not rotating pans; these benefit greatly if you do. Also, you must pull them from the oven while the centers are still quite soft. Not wet, but very soft. As with most oatmeal cookies these firm up tremendously upon cooling and we are aiming for crisp edges and soft, chewy centers. 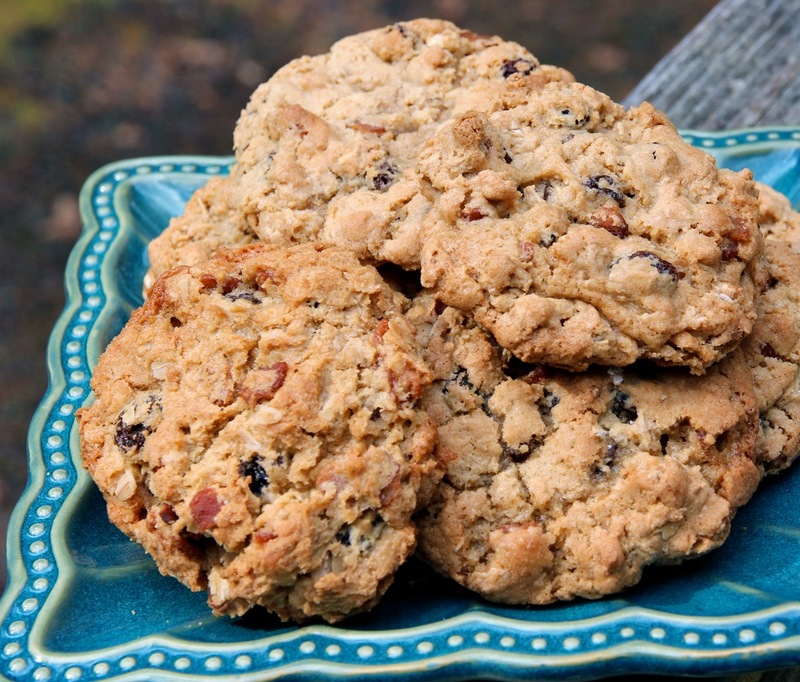 Check out the recipe for Autumn’s Bacon Oatmeal Raisin Cookies and the VIDEO of me showing you how to make them. They were a hit with my crowd; I think when I make them again I might add walnuts that I toss around in the bacon fat. As a follow up to my Oscar night cookies (shaped to re-create the key for the automaton in Hugo), I wanted to talk to you about rolled sugar cookies. Many recipes are out there and they are all pretty similar. They fall into 3 basic categories – 1. cookies with fabulous taste and texture; 2. cookies that really hold their shape; 3. ones that roll out very easily with dough that’s easy to handle in general. I’m afraid to say that all these things do not sync in most rolled sugar cookie recipes. Over the years I have spoken to many people who specialize in rolled cookies commercially, and I have to tell you that they focus on dough that’s easy to handle and that holds its shape well after baking. Then there are those folks who have their family recipes and they are often buttery, crisp and delicious, but don’t necessarily hold a precise shape. The 3rd aspect – that of an easy-to-work dough – is hard to address. Certainly some doughs seem to be easier to handle than others, but this often also varies with the experience of the baker. Doughs that I can handle with no problem might give the new baker a tough time because there are so many variables: temperature of ingredients, length of time dough has been chilled, your rolling surface (wood, metal, laminate, marble, etc. ), how much flour you dust on your work surface, your choice of rolling pin (heavy one with ball bearings, French, thick, thin, silicone, chilled marble, etc.) and how you use it (light touch, heavy touch, rolling back and forth, one direction only, etc.). Then there is how much time elapses before you place the cookies on a baking sheet, how you transfer them to a baking sheet, and on and on and on. When I was writing A Baker’s Field Guide to Christmas Cookies I knew that I had to include a basic rolled sugar cookie recipe. And, true to my baking approach, taste and texture were truly my priority. Of course, being destined to become all sorts of shapes, how they would hold their shape was important too. I tested and tested various recipes. Most rolled sugar cookies have very little, if any, leavener. Too much leavener and they wont hold their shape. The ingredients are always very basic: butter, sugar, flour, a dash of salt and a hint of vanilla. The recipe that I developed has a great buttery flavor and crisp texture, but I admit it is not that easy to work with (it contains a lot of butter) and while it holds its shape, there are other recipes that put that as a priority and result in a cleaner looking cookie. 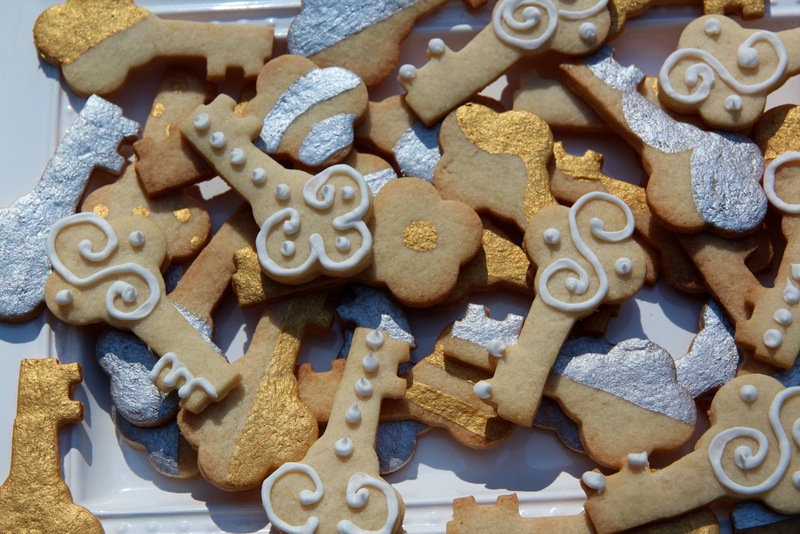 So, when it came time to make the key-shaped cookie for the Oscars, I was very concerned with shape. I called a dear friend who makes shaped cookies for a living. Would she share her recipe? She told me that she would but also warned me that her recipe was meant for “production”. That the dough was very easy to work with and that the shapes held very well after baking. The flavor and texture, she said, were secondary. This was going against my grain but hey, it was worth a shot just for fun and R&D. As you can see from the picture, the keys are truly very key shaped. I call them Shapely Rolled Sugar Cookies. The dough rolled out easily. Their “look” wowed everyone. The taste – in my opinion – just okay. Take this recipe with this caveat: use it when shape is a priority. Period. I say no more. Do I think that someday I will find a rolled sugar cookie that hits all the high points in every category? I hope so. Send me ideas if you have them; I’d love to try. Themed Birthday Parties; Yay or Nay? The winter of 2011/2012 will not go down as a very serious winter, weather wise. True, we did lose power for 5 days in that freak October storm, but hey, that was officially Fall. The winter has been mild. Still, it was a fun break to be invited to a Caribbean themed party for a friend’s 50th birthday. She promised to crank up the heat and requested that people dress appropriately (scantily). The potluck food was to be tropical as well. I slathered on bronzer head to toe, wore a T-shirt, shorts and sunglasses (inside) and tried to look like I was on vacation – which was hard to do since that day there was a lot of ice on the ground and a few cars got stuck in the driveway. Even though the winter has been mild, this is New England after all. My friend Mary and I were in charge of the cake. Initially I was thinking coconut….rum….passion fruit, but then the B’day girl informed us of a dislike of coconut. 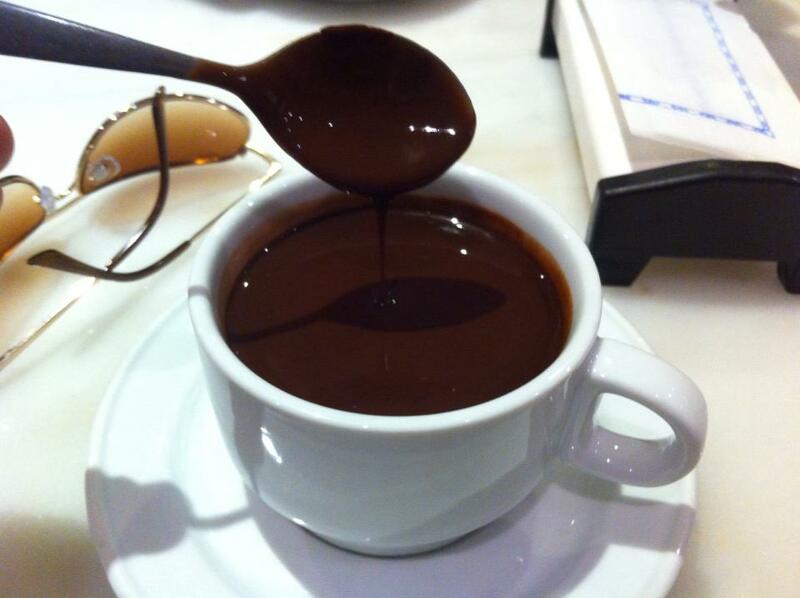 She is a chocolate lover, so I switched gears radically….how about chocolate….coffee….and Brazil nuts? Sometimes I am developing recipes using a specific product or for a particular company, but when I get to develop a recipe with just my imagination, that is the most fun. It occurred to me that I had never baked with Brazil nuts, which intrigued me even more.